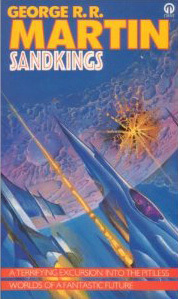 Martin's most famous short story is probably “Sandkings”, which won the Hugo Award for Best Novella and was later adapted into the first episode of the 1980s “The Outer Limits” TV series. The main character is a rich, arrogant man on a distant colony planet who collects exotic pets – the more vicious they are, the more he likes them. He thinks he may have found the perfect pet in a newly-opened shop selling exotic alien creatures – an army of tiny insect-like creatures called Sandkings. The Sandkings he buys are in four different colours, each colour has its own controlling mind called a Maw – a larger creature which is served by the ordinary Sandkings, which build a miniature castle to protect it, and bring it food. The different tribes are fiercely competitive and will fight each other to the death, trying to get the food that their owner tosses into the pen. For a while the main character is suitably entertained, and invites his equally shallow friends around to watch the miniature battles. After a while he begins to grow bored and he tries to spice up the battles by introducing other exotic creatures for the Sandkings to fight, and withholding food to make them fight harder, despite the pet shop's warning never to do that. This is especially risky since the Sandkings have a small telepathic ability whereby they can sense their owner and respond to his actions. After an accident some of the Sandkings escape and he finds himself trapped in his own home. This is a superb and unforgettable short story, the Sandkings are fascinating creatures and there is plenty of suspense in the later stages of the book as their erstwhile owner tries desperately to survive. Martin has written many great villains in his various stories but few are as entertainingly detestable as the protagonist here. It has appeared in multiple different short story collections, including "Dreamsongs" and the "Sandkings" short story collection. The “Sandkings” book also contains six other stories. “The Way Of The Cross And Dragon” is another Hugo winner, although it is far from being Martin's best work. It is a reasonably effective religious satire about a religious inquisitor who travels to a small colony planet to investigate a cult that have begun worshipping Judas Iscariot. Martin makes good points about the benefits and costs of religion but the story itself isn’t all that compelling, the plot takes second place to the ideas, although they are interesting ideas. “Bitterblooms” is a drab story about a country girl who meets a woman who claims to be from another planet. “Starlady” is probably one of Martin's worst pieces of writing, with an ill-advised attempt to use an alternative style of writing that ends up just being irritating. The plot isn't good either, telling the tale of a woman stranded on a space station with no money who is forced to rely on the dubious charity of a local ruffian. “The Stone City” is much better, a tale of explorers who have wandered far from human space and find themselves stranded on an alien planet built around a mysterious ancient labyrinth. The titular city is quite intriguing, and the plot is reasonably effective. “In The House of the Worm” is another good story; a small human civilisation exists in the caves at the top of an extensive series of caverns, inhabited by a semi-sentient hostile group of creatures who are hunted by the humans. When a group of foolish young men decide to follow the mysterious hunter known as Meatbringer down into the caverns they are in for some shocks, and a desperate struggle to survive. Again, the atmosphere in this story is very well done – both in the eccentric rituals of the humans and the inhospitable caves - and the plot has plenty of suspense. “Fast-Friend” is the remaining story in the book, a story unmemorable enough that I can't actually remember anything about it.